Made in the CE 2.0 which rules as we all know! Social behavior: Extremely independent culture where most of the species almost never meet each other. Every now and again the creatures meets in large consuls to speak about special events that might treaten them. 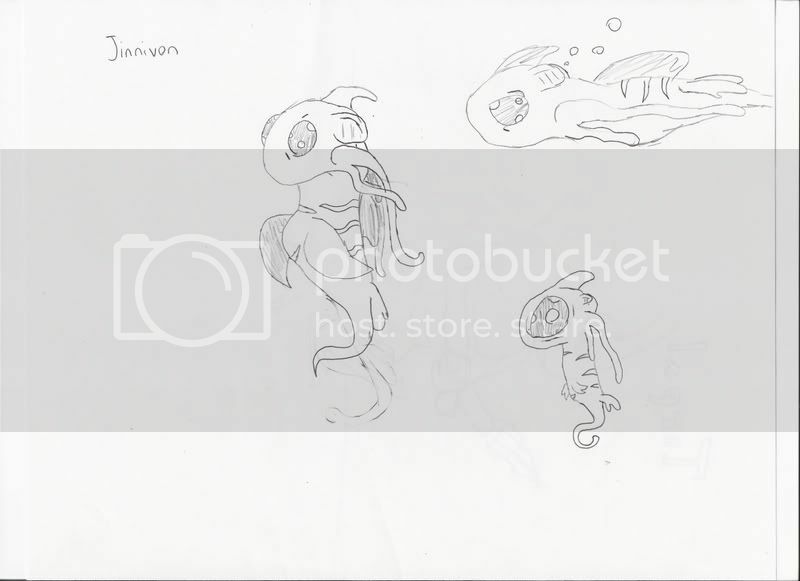 The Jinnivons are a aquatic creature that have 4 fins, 1 tail, 4 tentacles and 2 eyes. There small but swims fast. Ther mouth is hidden behind their tentacles. It use both there tentacles and is tail to hold and manipulate things. Jinnivons comes in all colors. Jinnivons general try to say away from each other. Almost every Jinnivons have a area which they them self have bin declared guardians over. The Guardian ship comes almost insticual so there is very uncommon for there to be fights over areas. If there is a conflict a emergency consul is often announced and that is about the only time Jinnivons ever meet each other with the exception of mating and the early family group. Some Jinnivons youth says in small groups even when they get older. This renegade groups often means trouble and guardians do anything to try to kick them out of there territory. If the groups becomes to hard to handle for one guardian consul is put in setion. Rangers are then sent out to put them down. Rangers are the a select minatory of warriors that exited to protect Jinnivons from other Jinnivons. There the only onces aloud to travel over a guardians area. They seek out renegades and put them down. It can be anything from a guardian that threaten other guardians or old youth bands that try to take controle. Rangers often works alone but have a little more contact with others due to the traveling. Still they try to live alone. Rangers train all there life in combat, hunting and stalking. This makes them a formidable foe. Guardians do ofthen do not have the time to train in combat and renegade youth bands often do not have the discipline so is not hard to see why Rangers are both feared and respected at the same time. Renegade rangers are very uncommon. now this is nice,+ for being aquatic,can't wait for a hand drawing. This creature is really original. you said, that they do live alone the most time...but if its so, how could they evolve a language or better: why should they think of a language if they never meet each other? Actually There Language is very short on words. And most of it is have its core in raising children or mating. There language have not change in a long wile. The good thing is because they have so little contact they do not develop any unique dialects. Also philosophy is a favorite past time so they need words to describe the world for them self so they understand it better. Just so they can structure there minds. But that is often a more private language and is often not written down. But When a new guardian takes controle over a area after the old one is gone he often learns the old guardians private Language if he have left any written remains. There are a little odd that way that they rather get to know the dead rather then living. And thanks for the question! I love questions! What about division of labor? From what it seems all of them need to farm for themselves to live, and with all the energy spent on farming, they can't do anything productive like science or literature. How do they deal with this? Are certain Gaurdians assigned specific jobs during the meetings? Well it simple. A Jinnivons do not need much to survive. There at top of the food chain (Which you may not believe because they are so small) and do not need to farm for there survival. In fact farming or should i say gardening is more seen as a hobby. But problems have bin looming on the horizon. Even if there growth have bin very slow there have now have started to overpopulate there planet. This is why they started to travel to outer spaces to find new areas to guard over. Many of these space travelers often stay on there ships all there lives. One thing one must understand is that Jinnivons progress slowly. We humans can accomplish more things during our lifetime then a 100 generations of Jinnivons usually do. And unlike humans they live in a greather harmony with there environment which makes it easier for them to survive. The key is slow but sturdy progress. Well first we are not talking about humans. Jinnivons are taught basic language when there young and this is imprinted in to there minds. So when it come to talking to other Jinnivon is a little like jumping up on the bike again. And yes is true that you do not need language to find a mate or to teach you childrent to survive. However even if the Jinnivon are top predators and usually have a easy time they have a few problems. One is the weather. It easier to survive if you know how to build a shelter. Even if they often do not have a permanent habitate they still need something to shield them self from the elements. A other thing is what to eat. A lot of food is poisonous and need special ways to prepare them before they can eat it. Because Intelligences do provide some benefits the Jinnivons Instictlevly seeks out other intelligent mates and that is where a language is used in mating. It maybe also why Jinnivons try to learn from the dead as they are not rivals. There is also a historic link. The early Jinnivons was very tribal and live in shallow water atolls that where shielded against the elements. On these oases life was even simpler but it did not take long before these primitive Jinnivons ran out of living space and started to war with each other. Those that survived where those that left the theses atolls and colonized deep sea. Because these atolls where to small they never where able to develop a sustainable society and the deep Jinnivons that became the modern Jinnivons finally just out competed the. There a still streaks of this in modern Jinnivons culture. The Youthgangs are seen as a primitive remnant. Is not hard to understand why Jinnivons try so hard to stop youth gangs. Well as for weapons and other technical developments. Whitening is often done of somewhat soft rocks tablets in the early age. Jinnivons are carefull to copy down anything written they found even if they them self do not write or even understand what is written on the tablets. This is rooted i a ancient tradition. Very few weapons have bin constructed by the Jinnivons. Most weapons have historically bin made out of diffrent rocks and the most weapons where made by the early shallow Jinnivons. Now in the modern era is Rangers that mostly construct weapons but some youth gangs try to arm them self. Rangers weapons are often more advanced as they have bin train to construct them from when there where young. Also Rangers pick up more tricks then regular Guardians and youth gangs during there travels. Guardians almost never arm them self and if they do then they are considered to be renegades and must be stopped. The first practical use of fire was discovered when the deep sea Jinnivons explored the thermal vents in the where on the bottom of the deep sea. The early deep sea Jinnivons discovers these hot places and learn how to use them. Guardianship was often shared betwine several Guardians over this area because of there importens and the guardians toke turns in using the thermal vents. Luckily for the Jinnivons the planet was and still is very geothermal active so there where many vent to share. Now in the modern age they have them self discovered how to generate there own heat sources so not geothermal are less important. Great detail, Yokto. Any indication as to how much further you're taking these guys?